The original L4B low voltage power supply design was a half wave rectifier powered from a low voltage winding on the filament transformer. 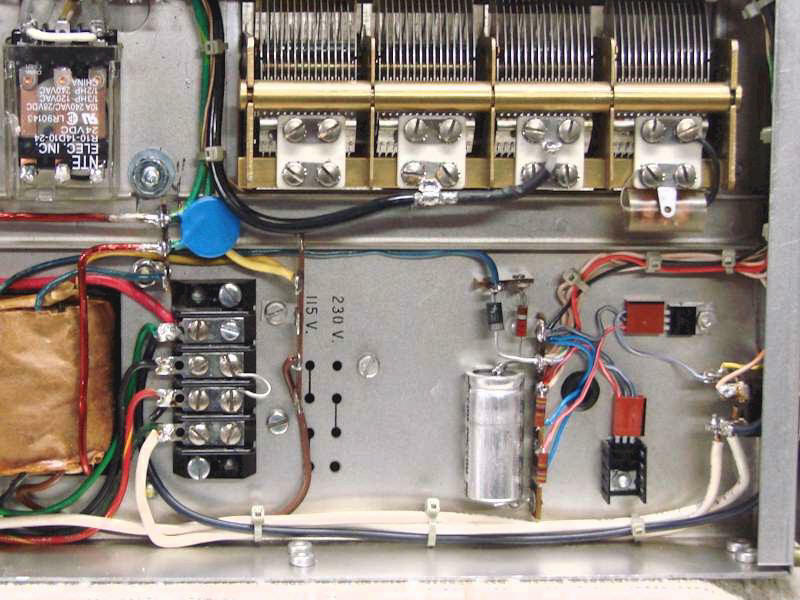 Its only function was to deliver unregulated +24 volts to power the antenna switching relay. 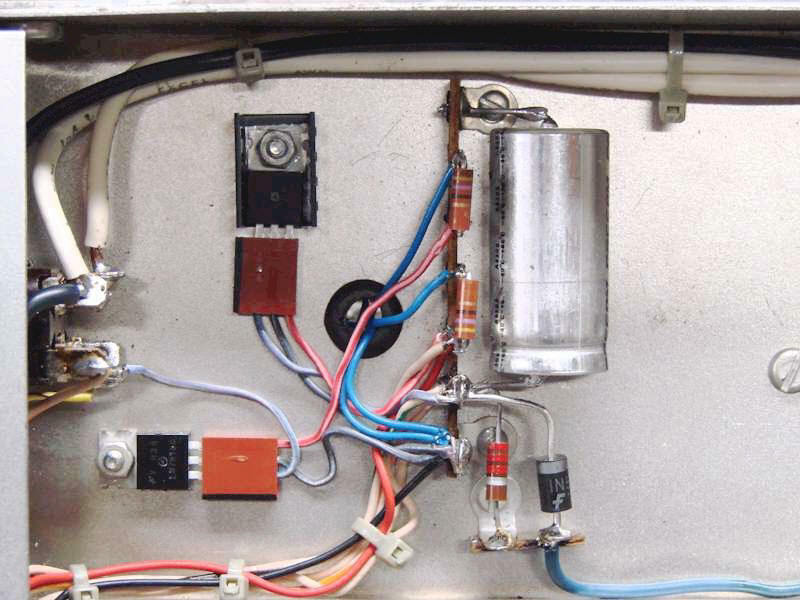 The new power supply design not only powered the antenna relay, but also powered the TUNE/SSB Mode relay, provided the ACG bias, the final tube fan, and power to the front panel pilot lamps. The new design included the same half wave rectification as before, but also includes a plus 12VDC regulated output. Both the antenna switching relay and the TUNE/SSB mode switching relays are 24V relay coils. The +24VDC output did not need to be regulated since voltage fluctuations was not an issue for the relays or the AGC bias. The pilot lamp and fan voltage was a different situation. Both the original pilot lamps were neon bulbs which operate around 100VDC. This voltage came from a divider network in the L4PS high voltage power supply. Since that was no longer used I had to come up with a different lamp powering method. I wanted to keep the front panel with the original look, so using a different type of lamp assembly was not an option. So I pulled out the pilot lamp from inside the holder and replaced the neon bulbs with a 12 volt lamps with wire leads. Using a small amount of hot glue in the back of the holder held the bulb firmly in place. I first hooked the pilot lamps directly to the power supply using load resistor to drop the voltage to 12 volts. I quickly found the unregulated voltage changed enough between transmit and receive modes and between the TUNE/SSB modes that the lamps constantly changed their brilliance level with each amplifier function change. To resolve the lamp flickering I added a +12VDC regulated output. This kept the lamps at a constant voltage and constant lamp brilliance no matter the mode or function selection. I also had the same issue with the final tube fan, with the change in voltage the fan speed would change slightly. It did not seem to affect the cooling capacity but you could hear the changing fan speed. Hooking the fan on the regulated 12VDC side now kept the fan at a constant speed. Here is a close-up view of the power supply area under the chassis. On the right side is the rectifier and filter capacitor making up the power supply with the large blue wire coming from the filament transformer at the bottom. The +12VDC regular is located at the top left with the heat sink. 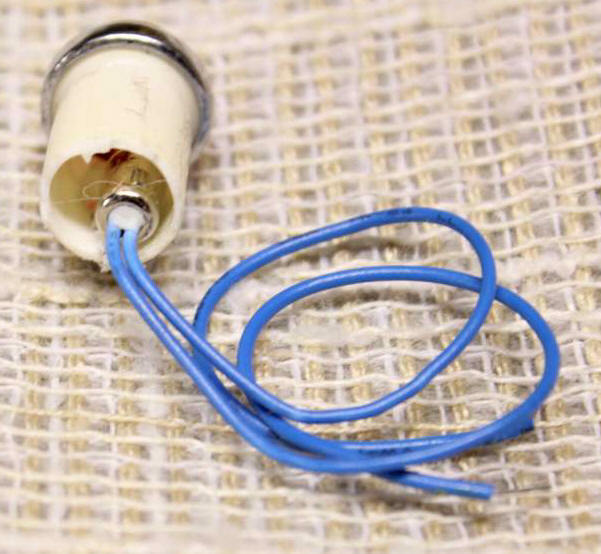 This supplies power to both front panel lamps through the 47 ohm load resistors and power to the fan. To the far bottom left is the backside of the red & black power switch. The black half of the dual switch assembly still switches primary power and the red side now switches a low voltage to the SSB/CW Mode relay which protects in from high current failure. This is the most common problem with these switches which this design solves. I mentioned in the previous section that I modified the panel lamps from the original 110VAC neon lamps to a 12VDC powered lamp. The conversion process was simple, I cut off the back end of the lamp housing off and pulled out the neon bulb assembly. The picture to the left shows the original L4B lamp on the left side and on the right is the lamp with the rear cut-off and neon lamp assembly removed. 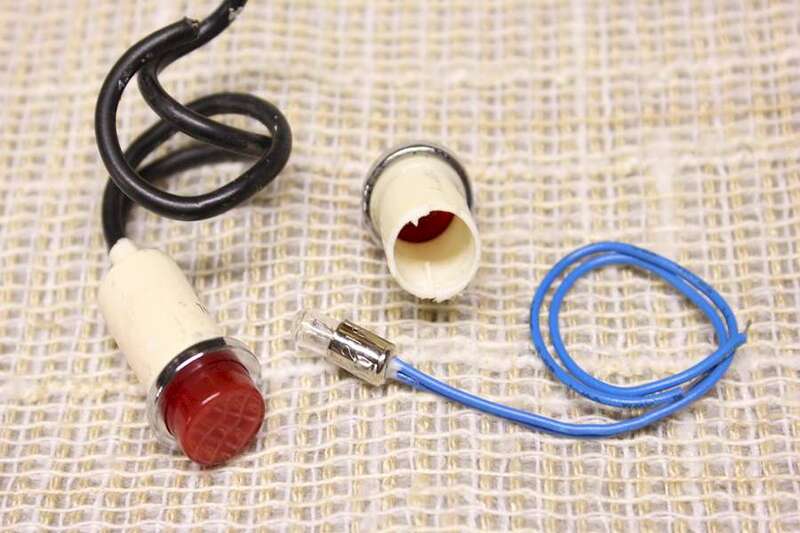 The 12 VDC lamp with the blue leads is then inserted in the back of the lamp holder and held in place with a small amount hot glue, as shown in the small picture below. This will hold the lamp in place but will snap loose easily to replace the lamp in case it goes bad. In the picture below, you can compare the L4B original neon panel lamp next to the completed modified lamp I used in the amplifier redesign. 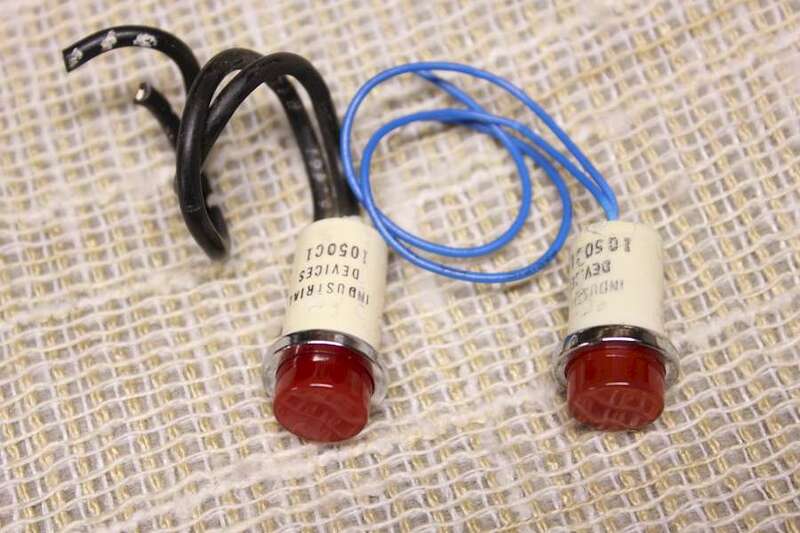 The L4B has two front panel lamps, the orange color lamp indicates main power is on, and the red lamp indicates the amplifier is in the SSB mode and the higher voltage level is selected for the final tubes. Both lamps were modified identically, and the bulb's brightness level is as good or better than the original neon bulbs.